A brief visit to Ardmore 30 July netted Barrier Air's recently delivered Cessna 208B Grand Caravan ZK-SDB parked on the taxiway while Dunedin based Mainland Air had Piper PA31-350 Cheiftain ZK-VIP on location, presumably in the area working for Barrier Air as noted in a hangar having some maintenance carried out was their Islander ZK-FVD. Originair's Jetstream 31 ZK-JSH has now completed its transition into the new operator's livery with titles added in recent days. It is seen here departing Wellington 30 July on a training detail which ultimately saw it arrive at Nelson. Ryan ST-M S2 ZK-ABC - what a magnificent aircraft! 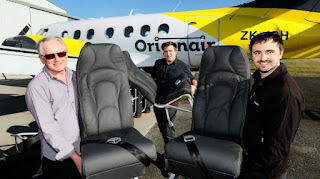 Originair owner Robert Inglis, left, Brent Hill, National Aircraft Interiors and Matt Ashton, RepairCraft with new leather seats that will be fitted in to the Originair, Jetstream 32 aircraft at Nelson Airport. A Nelson-based aircraft interior design company have come up with a custom seat product especially for Originair. 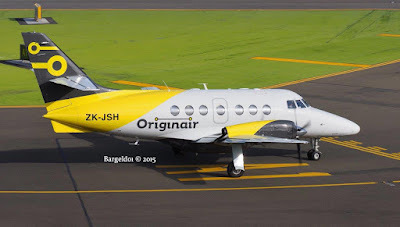 National Aircraft Interiors were given the brief for Originair's Jetstream aircraft which will soon be flying from Nelson to Palmerston North. Designed for passenger comfort, the seats have a modern look and feel with an added soft layer on the seat, said sales and marketing manager for National Aircraft Interiors John Hill. "Originair has chosen a high quality leather created for its durability and passenger comfort." Hill said he the company usually worked with large international airlines. "It's nice to be doing something for a New Zealand company. Passengers are going to be impressed when they see these aircraft. They're really smart." The seats are made of high quality leather. Industry standard aviation leather comes in a variety of quality ranges. The leather is expected to last for up to eight years, depending on maintenance. The leather has a modern matte finish that follows automotive industry trends. Hill said the automotive industry was ahead of the aviation industry in respect of comfort and design due to the sheer size of the industry and its research and development budget, and so is used as a source for design trends in the aircraft industry. The seats also feature yellow stitching on charcoal leather that matches Originair's brand. National Aircraft Interiors is an international company based in Nelson, serving the airline industry in New Zealand, Australia and the United States with an office in Los Angeles. Originair was established by Robert Inglis, who founded Air Nelson and then ran Origin Pacific Airways, which collapsed in 2006. It will fly Nelson- Wellington and Nelson-Palmerston North. 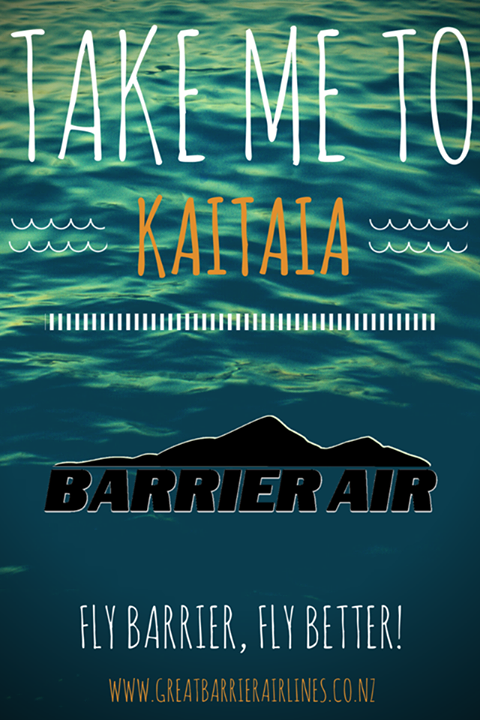 Its first flight from Nelson to Palmerston North is scheduled for Wednesday August 12. Sunair's Cessna 172 ZK-DPN had just arrived from somewhere. My ride to Wellington, Air New Zealand Link Beech 1900 ZK-EAR. The new entrant to the regional airline industry says flights from Dunedin to Queenstown will begin on September 27. Kiwi Regional Airlines (KRA) announced it had signed a sales and purchase agreement for its first Saab 340A aircraft from Polish airline Sprint Air. The airline also announced its ticket price for the Queenstown flight would be $134 one way, with an extra $20 for baggage. KRA chief executive Ewan Wilson, a former Dunedin man, and former boss of Kiwi Air, said he was also working towards having a three-person maintenance base in Dunedin. The airline's operations general manager, Bill Wilson, said the purchase of the Saab marked an important milestone in enabling operations to start. ''It delivers us a fully up to date, well-maintained passenger aircraft ready to fly in New Zealand skies.'' The corporate headquarters and the reservation service for Kiwi would be in Hamilton, which would also be the base of crews for the first aircraft. The aircraft would stay overnight six nights a week in Dunedin, with the three-person maintenance base ''currently under consideration''. Ewan Wilson said the Dunedin to Queenstown service would run twice daily Monday to Friday, with a return flight on Saturday and Sunday. The plan for a Dunedin maintenance base had been helped by support from Mainland Air, with the offer of a hangar for hire. There were statutory issues to be worked through, and the airline was talking to Dunedin Airport about space, and Enterprise Dunedin about assistance, considering new skilled jobs would be created. ''There seems to be a willingness from all parties to make something work.'' Ewan Wilson owns 54.55% of the shares in the airline. The other shareholders, with 22.73% each, are Auckland-based used-car importer 2Cheap Cars and Nicole Domett, of Hamilton. Hood Aerodrome will keep a light burning for commercial airlines after the council earmarked more than half a million dollars in the proposed long-term plan to reseal the runway, improve internal roading, and replace runway lights. The key projects as outlined in Masterton District Council's plan are part of normal airport maintenance that would keep it fit for commercial and non-commercial use. Masterton Mayor Lyn Patterson says the council had been looking for an alternative service provider since Air New Zealand's last flight from Masterton to Auckland in February, 2014, but had so far been unsuccessful. "We've been working consistently since Air New Zealand stopped providing services to look for another service provider. "What happened earlier this year, late last year was that when Air New Zealand pulled out of the other sites like Whakatane and Westport, all of the mayors got together - there were six or seven of us- and started to look at what we could do. "Air links are really important for us as a region from an economic development point of view, and so we had some discussions with central government about that. That led to the research and the paper that's being done by Local Government New Zealand that's due to be released next month. On a local level, we have, and are still talking to air service providers. The difficulty for us is that they're not all banging on our door, clambering to be here. "And there are not a large number of air service providers around to deliver the service. But I personally would still like to see a air service continue, particularly to Auckland and possibly Christchurch. It's just a matter of finding the right service provider that is prepared to come in here and deliver that service." Latest reports show that facilities at the airport meet the operating and safety regulations required for a commercial service including the terminal building, a taxiway, and hardstand. Replacement of the runway lights are expected to be completed within the year and will be funded using the council's depreciation reserves. 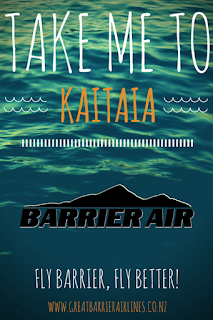 Want to go on the first flight??? Not cooperating in parking in a photographable position was the RNZAF's Beech Super King Air NZ7121. 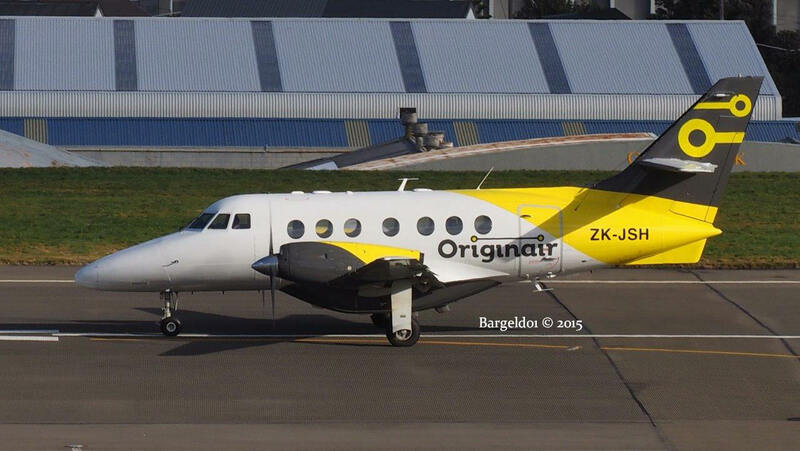 Confusion over who actually owns Kiwi Regional Airlines' first aircraft has developed between the new airline and its shareholder 2 Cheap Cars - before a single customer has made it onto a flight. Kiwi Regional Airlines chief executive Ewan Wilson says a press release put out by the second hand car dealer yesterday contained a factual error, and that he was never consulted about the release. The statement, put out yesterday afternoon, outlined 2 Cheap Cars' purchase of a Saab 340A from Poland "through its subsidiary Kiwi Regional Airlines". It said the plane was 36-seater, and opened with a line saying the car company would be "bringing its first aircraft into the country in a few weeks". Wilson took issue with any suggestion Kiwi Regional Airlines did not own the aircraft, or might be leasing it, saying "categorically" that the aircraft belonged to the airline, and he could "only assume...they were trying to express the fact that the airline of which 2 Cheap Cars owns some shares has bought an aeroplane." He also says the plane is a 34-seater, and the deal had only been signed at 9.20pm Thursday night, so he was unsure why a press release had gone out that afternoon. He wasn't consulted on the release, and still hasn't seen it despite asking for it. "I respect our shareholder's right to express their involvement as an investor in the airline, and obviously, at the next shareholder meeting there will be a clarification in terms of communication and who speaks for the company," he said. Wilson refused to answer any questions about the relationship with 2 Cheap Cars, saying instead that he was "very happy...that Kiwi Regional Airlines has brought an aeroplane". 2 Cheap Cars chief executive Eugene Williams says there are no problems with communication. However, he refused to answer questions over why Wilson had not been sent the press release, been informed about it, or whether it contained factual errors. Via email from overseas, he said simply that the press release was a 2 Cheap Cars release. The plane involved is the second run in the Saab 340 series, first produced in 1983. The 340A hit the skies in after 1985, and production on the Saab 340s finished up in the mid 1990s. Air New Zealand replaced its Saab 340s in 2004. Wilson says the plane is currently undergoing a thorough maintenance check, and will be repainted with the company's new livery. It will also have to undergo a CAA inspection before it leaves Poland. 2 Cheap Cars owns 22.73 per cent of Kiwi Regional Airline shares, while Wilson owns 54.55 per cent, and Nicole Domett owns another 22.73 per cent. New Zealand’s largest car import company will be bringing its first aircraft into the country in a few weeks. 2 Cheap Cars will be purchasing the aircraft through its subsidiary, KIWI Regional Airlines. 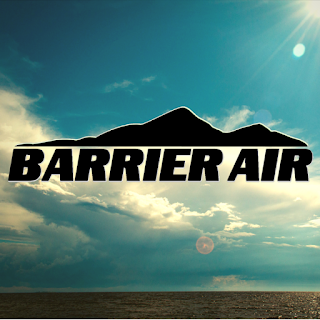 The new domestic airline will be taking delivery of the aircraft, a Saab 340A, from SprintAir in Poland. The Saab 340A can hold 36 passengers and is recognised internationally as a highly reliable and efficient commuter airliner. 2 Cheap Cars CEO, Eugene Williams, says arrival of the aircraft is an exciting milestone in establishment of KIWI Regional Airlines. “Our aim is to be operational before the end of the year and the early arrival of our first aircraft is a key part of achieving that goal,” says Mr Williams. Mr William says KIWI Regional Airlines is putting together its management team that will oversee the operation of a domestic airline that will be flying predominantly outside of the main centres. As well as having former Kiwi International Airlines founder Ewan Wilson as CEO, KIWI Regional Airlines has appointed experienced pilot and flight operations executive Dale Webb as Manager Flight Operations. 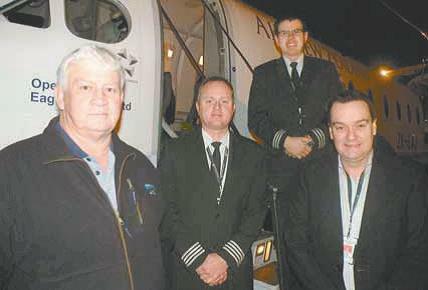 Amongst other roles he has previously been Operations Manager for Mt Cook Airlines. Other appointments made by KIWI include Peter Ashford, of Dunedin, who has been appointed as the airline's Quality Assurance and Safety Management Systems Manager. Mr Ashford has airline management experience in Australia, New Zealand and the South Pacific, including working as a Safety Auditor and an Airworthiness Inspector for the New Zealand CAA from 1998. In addition KIWI has appointed Bill Wilson as General Manager Airline Operations. Mr Wilson has extensive airline experience in New Zealand, including flying the Saab aircraft with Air Nelson, as well as flying Boeings for Freedom Air and seven years with the New Zealand Civil Aviation Authority as an Airline Inspector, and Rules Project Specialist. The opportunity to establish the airline came about following Air New Zealand’s decision to discontinue flying a number of regional services. 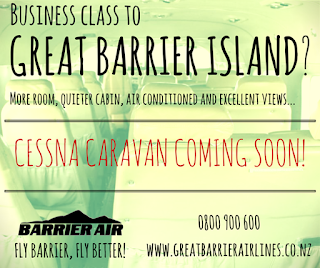 With the arrival of the new Cessna 208B Grand Caravan N988BA the Great Barrier Airlines has been rebranded as Barrier Air... Agairnz caught the new Grand Caravan which will be used on services to Kaitaia and Great Barrier Island arriving at Ardmore yesterday, 14 July 2015. During 2002 Air Nelson's Metroliner services were replaced by Eagle Air using new Beech 1900Ds. 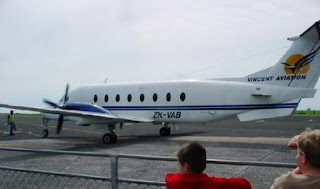 The transition took place over several months with the first Eagle Air Beech 1900D Wellington-Westport-Wellington service being flown by Captain Brett Moffat and First Officer Aaron Murphy in ZK-EAK on the 15th of July 2002 while the last Air Nelson Metroliner flight to Westport was operated by ZK-NSJ on the 8th of September 2002. From the 19th of March 2004 Eagle Air reintroduced Saturday services to Westport which Air Nelson had dropped. Flights were further increased on the 12th of February 2007 when Air New Zealand doubled its weekday flights between Westport and Wellington to two a day. This necessitated the lease an extra 19-seater Beech 1900 from Wellington-based Vincent Aviation and, later, an Air National BAe Jetstream 32. Eagle Air general manager Doug Roberts said the new flights would cater particularly for the business community which needed a weekday return flight between Westport and Wellington. “It’s what the business market wants. It meets connections – it works a lot better than a single, middle of the day flight. It’s a risk for us to do this, but we hope we have done a proper analysis,” Mr Roberts said. He believed the new schedule would boost flight loadings on the route from the current 66 percent. “Generally we want our flights performing at the 70 per cent level, but we think if we improve the timings, even though it’s double the number of seats, it will more than perform.” Westport Airport would need new lighting for the proposed early evening flights to continue at the same times through winter. “If that doesn’t happen we will move the timings forward by about 20 minutes.” The new weekday timetable saw flights depart Wellington at 8.10am and 4.40pm and depart Westport at 9.15am and 5.45 pm. There was a positive response to the two flights with passenger numbers doubling on the Westport flights. One positive result of the new service was that the Buller District Council installed landing lights. From the 6th of July 2009 Air New Zealand launched a new service between Westport and Christchurch on a six-month trial basis. The new service, operated by Eagle Air, was flown on Monday and Friday mornings and evenings using Beech 1900D aircraft. Eagle Air General Manager Grant Kerr said he was pleased to launch the new four times a week service, which would make it quicker and easier for customers travelling between Westport and Christchurch. “We have been evaluating the potential for a direct service between Westport and Christchurch for some time, in response to direct approaches from a number of customers keen to make it a reality,” he said. Mr Kerr said Air New Zealand has been in discussions with energy producer, Solid Energy for nearly four years about potentially operating a service between Christchurch and Westport. Solid Energy’s Stockton Opencast Mine, just north of Westport employs about 700 people. A number of company staff from Christchurch regularly travel to the mine, along with other contractors and consultants. “Solid Energy has committed to supporting the new service and this has certainly given us the confidence to launch,” Flights departed Christchurch at 6.25am and 4.15 pm and left Westport at 7.25am and 5.15pm. The first flight was flown by Beech 1900D, ZK-EAJ under the command of Captain Alistair Marshall, First Officer Dan Bolton. The major customer was the state-owned coal company Solid Energy and Air New Zealand planned to put the service on hold over the summer break from the 19th of December to the 31st of January 2010 while the mines were closed. However, over the summer break Solid Energy said it would not subsidise the flights and the service didn't restart in the new year. In October 2012 a downturn hit the mining industry which in turn meant a weakened demand for flights. In February 2014 the Saturday flight and Wednesday morning flights were cut and Air New Zealand told Westport, "The message to people is use it or lose it." 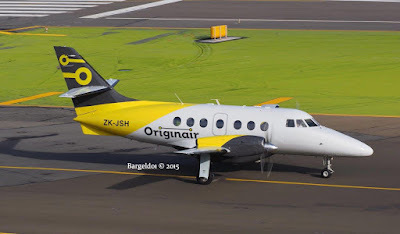 Air New Zealand's decision to drop its Beech 1900D aircraft from its fleet was the final straw for the Westport service and in late 2014 the national carrier announced it would withdraw its air service from Westport. The final flight was operated on the 28th of April 2015 under the command of Captain Andrew Mercer and First Officer Jason McDonald in Beech 1900D ZK-EAN. 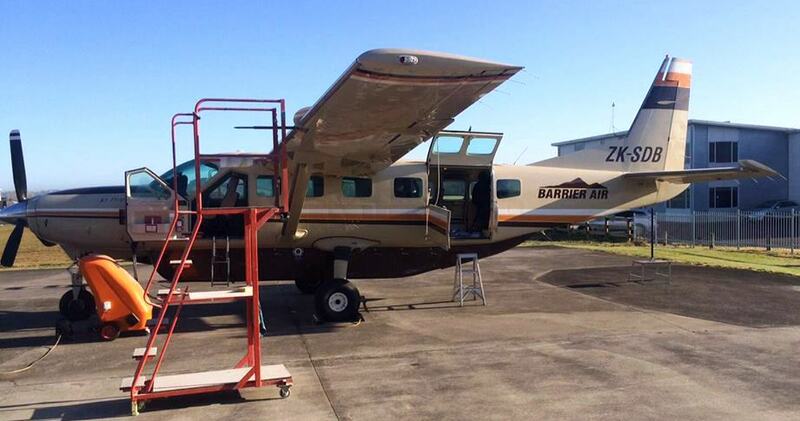 13 passengers flew into Westport on Eagle flight NZ2587 while only 5 passengers flew out on the last flight, NZ2588. The final service to Westport operated on 28 April 2015 by Beech 1900 ZK-EAN.